It all began with Marinma. I met this radiant, beautiful Spanish woman at the Passion Test Facilitator's Course in Florida last February. I was attracted to her fiery personality and the ring of her laugh. Her very presence reminded me of a time when I vowed to go to Spain and stay long enough to get conversational in their language. We bonded quickly and shared our life stories. She told me about her past which reflected fragments of my present. She spoke to me in the voice of truth that seemed like I was speaking to myself about things I already knew. She helped me let go of a relationship that no longer served us both. In that moment, I told her I intended to meet her again. I held this vision of having a churros con chocolate with her in Madrid. You can even add ladies hats to this pretty picture. No date, no hows, just the vision of us seeing each other again. Any ladies who would like to run with the bulls in Pamplona in July? It was posted by Jeannie Mark of Nomadic Chick. I swear I almost jumped off my seat! Not only is Jeannie my icon when it comes to kickass women travelers, we almost met each other in the Philippines when she came over early this year. The schedule was not perfect, I was surfing in Baler as usual and she was in Manila. But I had to meet this lady who made me teary eyed with this post. And did she say SPAIN?! I not only get a chance to see Marinma again but to also get to explore Spain for this exciting festival! It took a lot of self-control for me not to start packing my bags then and there. When I started thinking straight, I realized there were a lot of things to consider. Who was I and my blog for them to include me in this incredible global challenge? How in the world was I going to pay for this trip after exhausting most of my resources from our recent Asian jaunt? I don't even jog- how was I going to run for my life to avoid getting trampled by bulls! Doubts started creeping in! But if you knew me even a little bit, you would say I'm more bull-headed than any bullrunner you know! Once I'm set on doing something, I wouldn't let anything get in the way. Even myself. I've always believed that anything that gets in the way of your dream is but a brick wall. And you know what Randy Pausch says about brick walls? "The brick walls are there for a reason. to show how badly we want something." As a Filipino traveler, I have encountered a lot of these brick walls myself. People telling me I can't just because they themselves could not. The popular misconception that travel is nothing but a selfish endeavor. The perceived high cost of travel and all the planning and preparation it entails. As a woman traveler, there are more brick walls and even road blocks. The onslaught of questions and judgments: Is it safe to travel as a woman? Women should not go wandering off by themselves! This running around half the globe is not becoming of a woman. You should start putting down roots, thinking about career, marriage, kids! And a woman who wants to be a bullrunner? What about her? 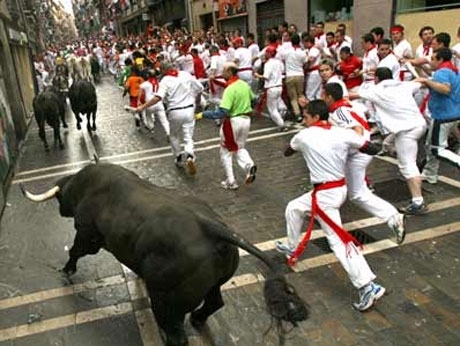 So far, I've heard the words crazy, death wish and trampled on when I tell people about my plan Pamplona plans. 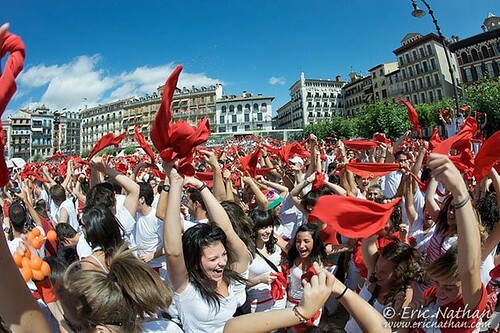 In San Fermin – women have continually been discouraged or cautioned against participating. There's even a post about why women aren't running with bulls. Jeannie mentions some people think it's illegal for women to join. First off, I want to tell you that I'm not doing this challenge to prove anything. Not even to myself. Nor am I doing it as a feminist act that whatever men can do, women can do better. I am going to run with bulls because I want to experience it firsthand. And isn't that what travel is all about? To see with your own eyes, to feel the rush, to experience everything yourself? True, the idea is pretty unusual and not every woman may want to try it or feels they can. There's definitely the potential of danger. But I'm grateful that I won't take that risk by myself. I'm running with 5 other fearless, beautiful women who believe that travelling is nothing but a world of risk. We learn from it. Falter. Taste success. And we want to share this novel experience with all of you. I will run with the main instigator and lifelong gypsy Jeannie Mark of Nomadic Chick. Licensed jet-setter and perpetual expatriate Nicole Blake of Nicole is the New Black. Panda lover and voracious traveler Nicole Smith of Bitten by the Travel Bug. Aspiring polyglot who teaches her way around the world, Oneika Raymond of Oneika the Traveller. Check out our new website girlsrunningwithbulls.com for the complete list of participants and their profile. As always, ever supportive Roomorama has got our back! This company was founded on the principle that there is more to travel than visiting a checklist of tourist attractions. Launched in 2009, Roomorama has since become the leader in the development of online rental communities. The discerning traveller (that's us!) can select from a range of short-term rentals and be guaranteed streamlined and secure transactions. 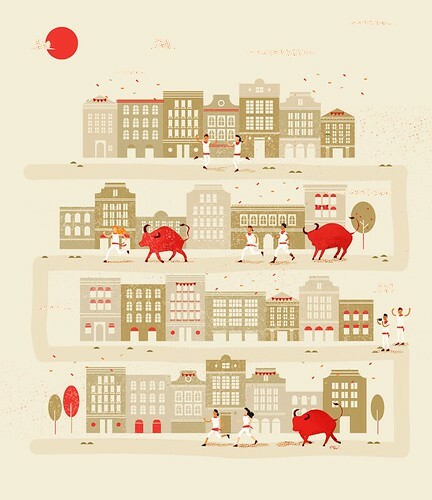 We are so pleased to have Roomorama as our main accommodation provider in Pamplona. Check out this gorgeous flat overlooking the bridge over river Arga where they're putting us up. Eurail sells train passes online to travellers from all over the world. They are a subsidiary of the Eurail Group, which is a cooperation of 30 European Railway companies and shipping lines. Eurail offers Rail Passes to non-European residents who want to explore Europe in the best possible way: by rail. Eurail is providing us with- wait for it- GLOBAL PASSES!!! It's the perfect opportunity for us to explore Europe as we journey to Pamplona and beyond! HostelBookers has operated as an online travel agency for seven years and employs over 100 people. They aim to provide customers with unrivaled service quality and value for money, which is why more than five million travellers visit their site each year. HostelBookers is providing us hostel accommodations from various points in Europe as we train it to San Fermin. We’d like to thank all our sponsors for their help and guidance! So what's in store for us in July? Apparently an experience that's so fast, furious, dangerous that it's likely to be outlawed in the near future if I listen to Michael Hodson of Go, See, Write. Read his full account of the bull run. You can expect a lot more posts as our travel plans progress. For more exciting details watch this video of the sights and sounds of Pamplona through the lens of traveller extraordinaire Rick Steves. If this doesn’t make you want to jump on a plane to Spain, nothing will! And for those who fear for our lives. Don't fret. We're not going into this blindly. We have a group of people supporting us and a lot of resources to read up on. 1 Spread the word about girlsrunningwithbulls.com, Like us on Facebook or follow us on Twitter for updates on this hair-raising challenge. 2 Motivate me to please start running- like NOW? 3 Add to the dwindling travel fund by clicking on the donate button below. I promise to send you pretty postcards and flying kisses from Pamplona! Di ko alam na may ganyan pla, parang kelangan mabilisan na takbo nyan! Haha wow you're nuts!!!! What an adrenaline rush! I'm sure that running with the bulls would be an awesome experience but idk if I would ever have the guts to do it. Yikes..mukhang dangerous nga pero kaya mo yan! Eurail eto ung ginamit ni Ethan Hawke to travel Europe sa movie na Before Sunrise/Sunset tama? Sarap naman halos sponsored lahat ng expenses. this is going to be epic! goodluck, lois! This is one off your bucket list! How exciting! I'd love to do this myself someday. Aww I had to back out of the running and I'm going to miss meeting you! Wow! What an exciting challenge! I'm excited for you. Will be keeping myself. :) Good luck!